The Gateway combines two large LED screens with the LED lit Diagrid to make a strong statement. A plan drawing of the area where City Walk is located, and how the three areas are positioned. Float4 was brought on to the project during construction, when the street was still sand. A view of the Diagrid being built against the skyline of the city. The Place Des Lumières displays were rigorously tested by the Float4 team before opening. Another behind-the-scenes view of work on the show at the Place Des Lumières. Testing at the Place Des Lumières reveals the huge hydraulic arms rising from the fountain. The scale of the Diagrid, and the City Walk project is impressive, as illustrated here. The Gateway at night dazzles. The idea of an outdoor pedestrian shopping and recreation area is unique in Dubai. 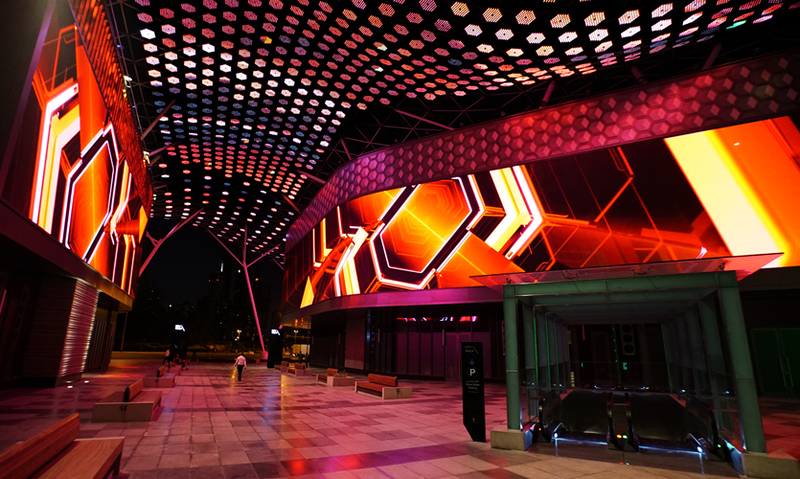 The Gateway is outfitted with two massive LED screens, 70- and 85-meters long. A "close-up" view of the Diagrid and screen at the Gateway. 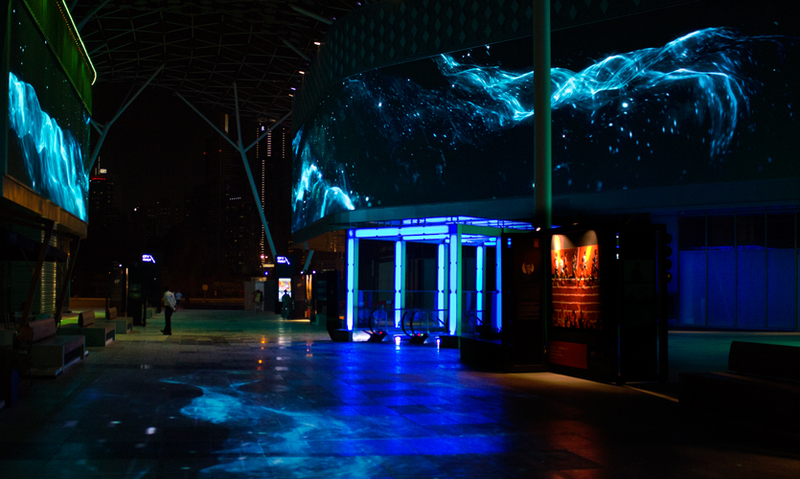 The Showstreet is the retail-encased corridor connecting the Gateway and the Place Des Lumières, which has been outfitted with special lighting and a ground projection spanning approximately 77 meters. The Showstreet area highlights the surrounding architecture and the way the projections and canopy affect the visual perception of the space. 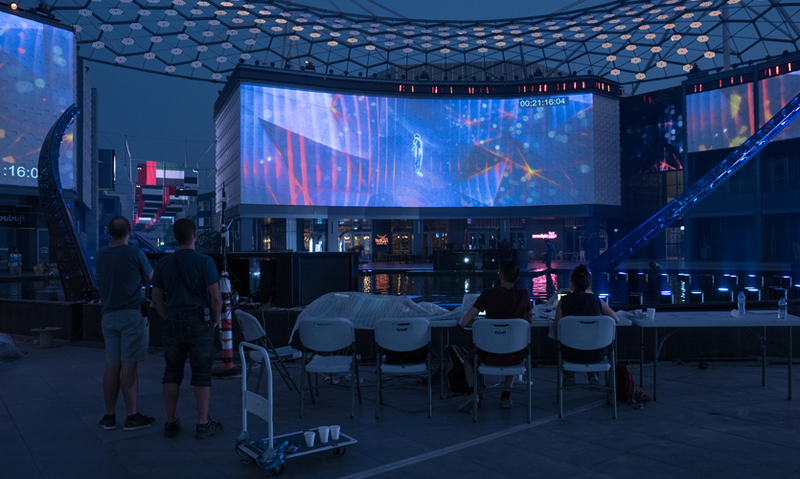 The movement of the hydraulic arms, combined with the projection mapping enhances the illusion that the space, is changing and morphing when the show begins at the Place Des Lumières. Over 120 lighting elements and projectors transform the space during the shows. The projector lifts at the Place Des Lumières had to be built to resist water infiltration because of their proximity to the fountain. City Walk lit signage welcomes visitors into this spectacle after sunset. Alexandre Simionescu, Co-Founder of Float4 (New York), has been traveling to Dubai, U.A.E., for the last 10 years and developing business in the area for four years. His strategy has paid off in digital experiential projects like the recently completed City Walk for Meraas Development. Float4 became involved at both the strategic and tactical levels during early concept development for City Walk. After seeing all the media elements Meraas wished to implement, the firm focused on content creation, program strategy and technology infrastructure design for this new outdoor retail environment. They developed a content strategy that incorporated ambient visual content, advertising opportunities and entertainment options. Ultimately, Float4’s role was that of an executive producer, bringing in several collaborators, including XYZ Technologie Culturelle (XYZ), to take the project to completion. 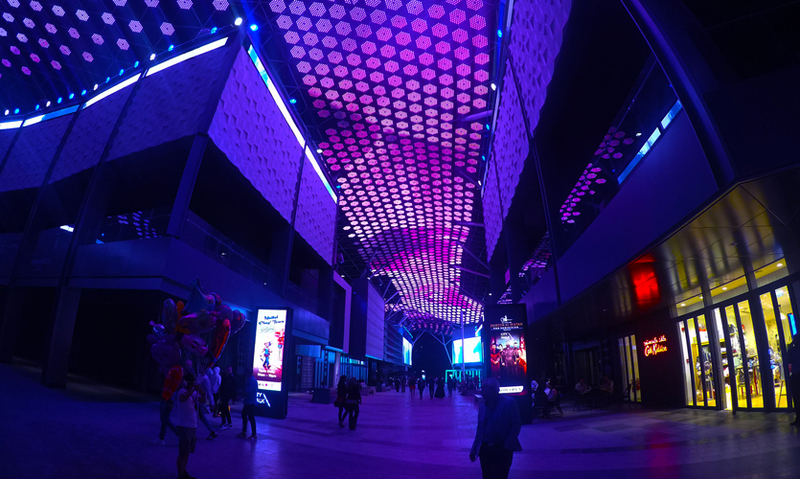 City Walk is a new concept for Dubai, which only recently began adopting outdoor pedestrian retail settings. Meraas wanted to develop a high-end lifestyle-centered space with retail, dining and wellness settings alongside an outdoor entertainment experience. City Walk is meant to provide an engaging, aesthetically pleasing open area for residents and tourists to enjoy, in spite of weather conditions. The Float4 team was tasked to create a memorable environment by carefully curating digital experiences throughout the space. They began by taking inventory of requests and hardware like LED displays, projection and lighting, which had already been specified for the project. The next step was to create harmony throughout the multimedia infrastructure to develop a comprehensive, scalable, cost-effective and “future-proof” solution. 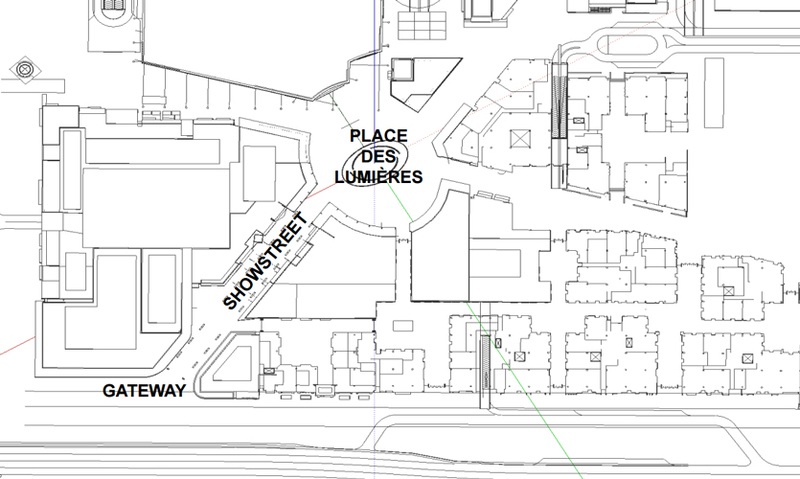 The City Walk space is broken up into three areas: the Gateway, the Showstreet and the Place Des Lumières (plaza of light). As its name suggests, the Gateway is the primary point of entry and faces one of the main streets of Dubai. 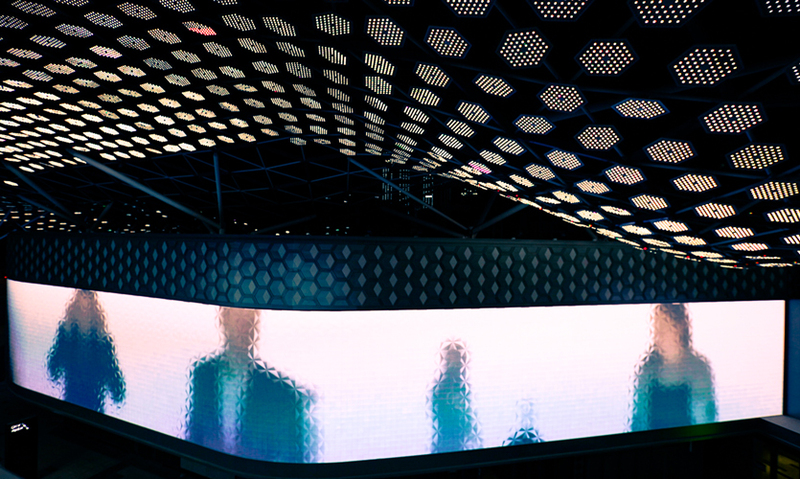 This part of the space is outfitted with two massive LED screens, 70- and 85-meters long. The primary purpose of these immense panels is to introduce the space, retailers and brands and provide an avenue for advertisement. 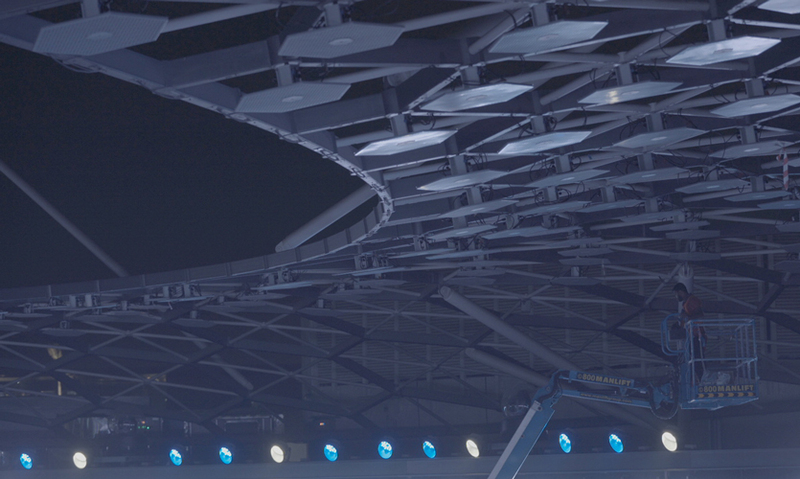 Additionally, an architectural LED element known as the Diagrid forms a sort of digital canopy and connects the three areas. The Showstreet is the retail-encased corridor connecting the Gateway and the Place Des Lumières, which has been outfitted with special lighting and a ground projection spanning approximately 77 meters. The Showstreet also contains secondary LED displays, which look like strips in this context, despite their 50-pixel height. Conceptually, this area is more about the surrounding architecture and the way the projections and canopy affect the visual perception of the space. The third part of the space is the Place Des Lumières—the part of City Walk exclusively focused on entertainment and delight, especially after sunset. The Place Des Lumières is a large rounded space, with an enormous ovoid water feature as its centerpiece. 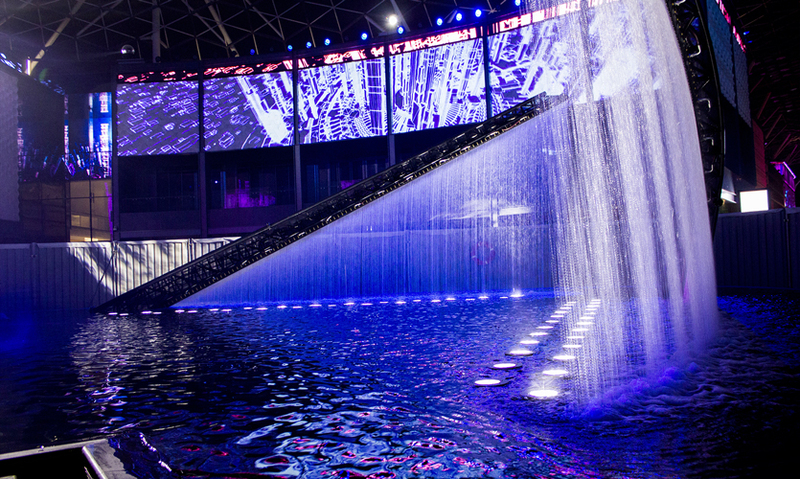 The fountain is outfitted with four colossal (10-meter long) hidden hydraulic arms that are rigged with special nozzles to create both veils of mist and water curtains. Over 120 lighting elements and projectors transform the space during the shows. The movement of the hydraulic arms, combined with the projection mapping enhances the illusion that the space, is changing and morphing when the show begins. The Float4 team’s scope on the technical side included two major parts: the design of the head-end system and the content. 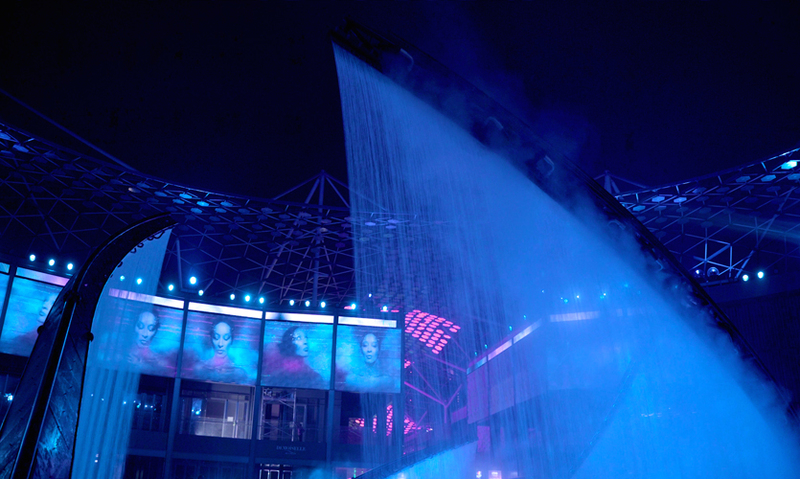 This also meant that the design of the water feature projection system fell under their scope, which was no small task because the client requested an inconspicuous solution to house the four 20,000 lumen projectors which projection map the water screens. The solution they reached in close partnership with XYZ was a series of custom lifts that bring the projectors out of traps in the ground. The mechanisms had to be built to resist water infiltration because of their proximity to the fountain. 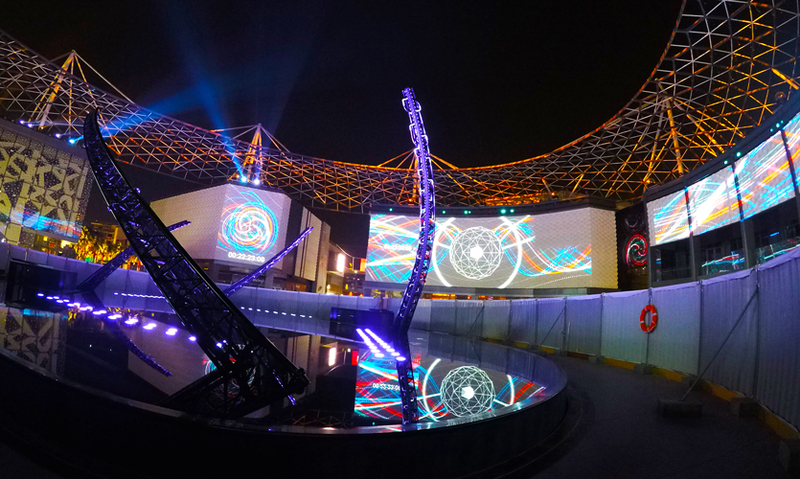 The Float4 team took great care in designing the head-end system, which powers City Walk’s experiences. 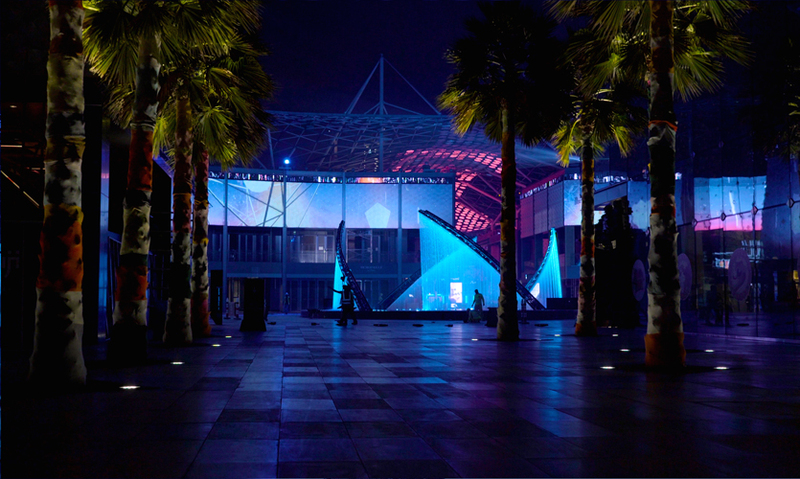 The design focused on flexibility and redundancy without compromising performance—a vital prescription when using 30 projectors and 100 million pixels of content in the heat and dust of Dubai. Given the number of screens, pixels and variables, there were imperatives regarding performance, flexibility and redundancy, namely because the system runs 24 hours per day. The system is built with 60 high-definition outputs (all of which are in simultaneous use), including the backup designed for hot-swaps. 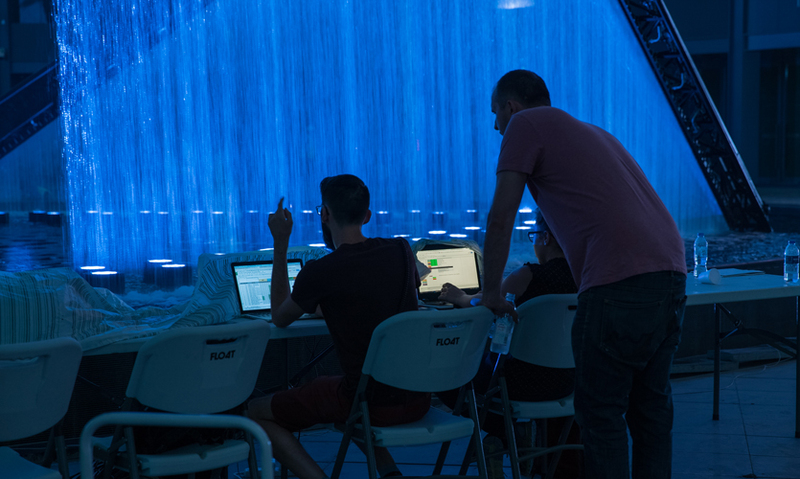 “It takes a lot for a system to fail totally, but even in that case, we have the ability to switch to a backup very, very quickly,” says Simionescu of the way Float4 designed the redundancy system for City Walk. The server room looks like more like a data center: Fourteen racks of dedicated hardware run City Walk in part using Float4’s latest product, RealMotion. 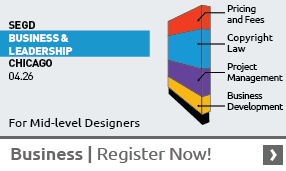 RealMotion is a software and hardware combination that helps create environments that are heavy on real-time content and interactive elements. RealMotion also performs all of the tasks that a traditional media server does, like video playback and synchronization. 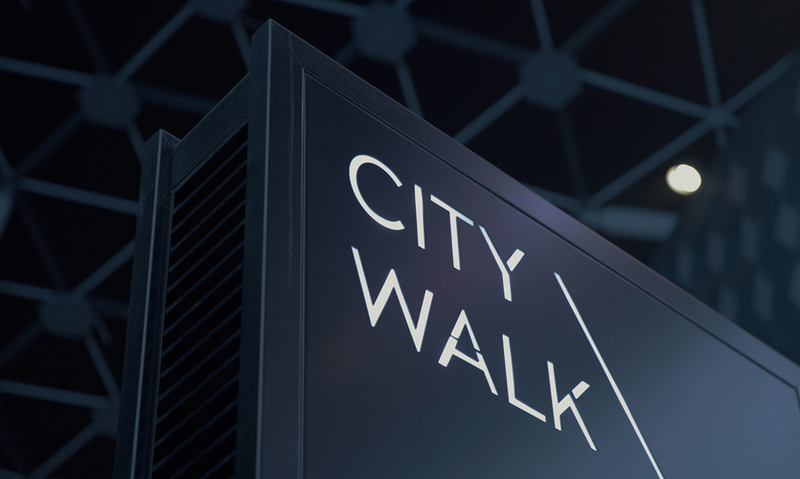 The reason for building City Walk using RealMotion was part of their larger plan to “future-proof” the project by utilizing specific technologies that will allow the operators of the space could easily switch to more cost-effective generative content or an interactive element in months or years to come, keeping the experience fresh. During the preliminary research and concept phase when the Float4 team was establishing the project vision, goals and requirements, they had to consider a short timeframe (18 months) for completion as well. To quickly move to approval on the project, which hadn’t been built yet, they used virtual reality to provide better visualization tools and make design decisions more effectively. When defining the content goals, there were several factors to take into consideration, including the display technologies used, the long-term content strategy and the diverse cultures of the audience. From a content production standpoint, the team had to fine-tune the production pipeline to minimize the potential impact that working with a multitude of display technologies and resolutions can have on the timeline. Beyond the technical and creative challenges, they had to consider a sustainable business case for ongoing content production, with the knowledge that production budgets available during construction phases would not be comparable to the ones available during operation. This was one of the keys to ensuring the viability of the content strategy. On the creative side, the Float4 team worked to distil the purpose of each content piece, since some were tied into promotion and revenue, while others were focused on ambiance or entertainment. Exercising cultural sensitivity was also particularly important in the multi-cultural cosmopolitan city of Dubai. 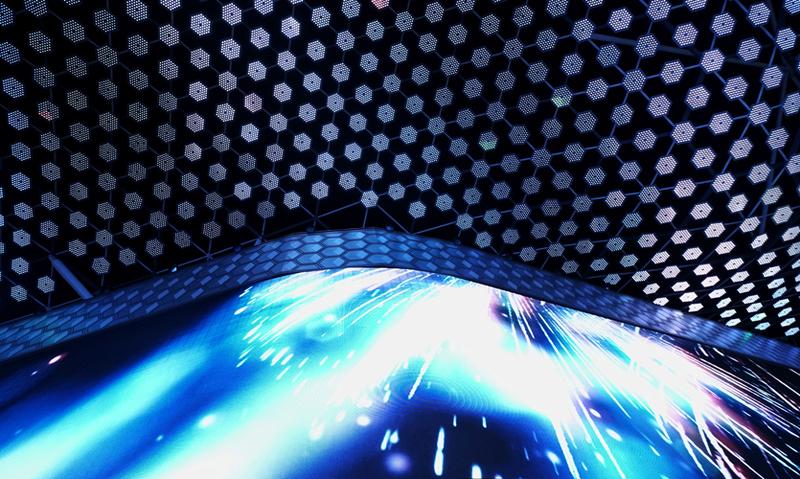 Float4 collaborated with Fly Studio on the composited videography featuring floating figures with the goal of creating a synthetic/organic tapestry. Currently, they have produced six hours of unique content used in City Walk. 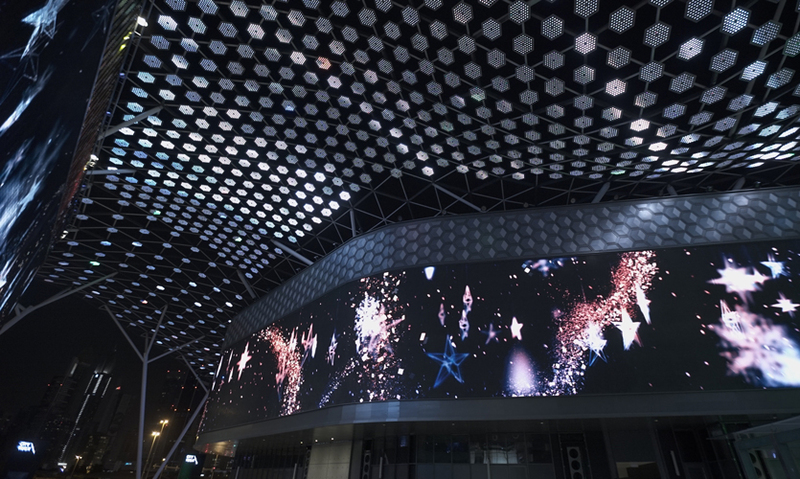 The grand opening of City Walk was held on the 45th anniversary of U.A.E.’s Constitution Day, on December 2, 2016, to much acclaim, as the digital experiences create value and a sense of place while connecting visitors to shopping, dining and entertainment. While the Float4 team has used varying rubrics to measure their success, perhaps the most obvious success metric is how often visitors take out their phones to film the space, the show and take selfies. One visitor even shot it on two phones simultaneously—a definite sign that the team had succeeded in crafting a memorable experience.